If you are building a new home or have a remodeling project, then no doubt you have stumbled upon Houzz.com and have the downloaded the app on your smart phone. Houzz is quickly replacing the old school decorator magazines, about home design and style, found in the grocery checkout isles. This site is a great place to gather inspiration on home design and fashion. At Grand Floridian Builders, we use Houzz for two purposes. First, to connect with our fans and share some of our finished design and building projects. Houzz has a great message board, where customers can ask questions about projects and pictures posted. One of the main reason Houzz has become so popular is the collaboration between Houzz and the professionals. Houzz staff and writers are continually featuring new projects and articles on trending design concepts and how to projects. If you google almost anything about building or design, most likely the first few listing will be something from Houzz.com. The second function that Houzz serves, as our picture search engine. When we are discussing a specific interior feature, design idea or even discussing what type of wood trim to use in one of our designs, we will go to Houzz for images to share with a client as a further reference point. Thanks to many designers, builders and home aficionados, that have shared their own photos in Houzz, you can find almost anything you might be looking for on their site. 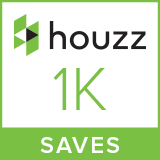 We started our listing on Houzz about two years ago, and are proud to announce our recently earned badge on Houzz! We have had over 1000 of our photos saved to different peoples Ideabooks. We are grateful to all of our homeowners, interior designers and vendors that work hard to make each Grand Floridian built home, a true work of art! We are so glad that others are enjoying and getting inspiration from the beach homes we build, on the coast, in Northwest Florida.